In 2018, current CEO James Napier being a knee down amputee was determined not to let that disability affect him. James reached out to a friend, fellow patriot, serial entrepreneur, and current COO Lance Wood. Together while eating some special hot sauces at a local barbecue, James thought that he could sell these hot sauces. In collaboration with their wives, where everybody brought a certain skill set to the table, The Patriot Brands LLC was launched shortly afterward selling 12 hot sauces. Just two weeks later, requests were coming in for similar specially designed labels. Quickly, the branding side of the company was added with an in house graphic design to sell labels at a fraction of the cost. Eventually, an in-house fulfillment center was added to further reduce costs. James then resurrected his dream of selling jerky. Being a local mom and pop shop with great capacity as a full service meat processor, James had secretly been working on perfecting some jerky flavors. Teaming up with trusted FDA certified processor Kill to Grill with their decades of experience manufacturing jerky, this The Patriot Brands Jerky was officially launched, and sold to the USA, Australia, Ireland, Britain and the United Kingdom. 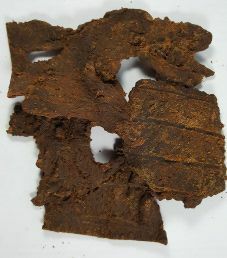 This jerky is distributed by The Patriot Brands LLC, and they are located in Cuba, Missouri. The first review on The Patriot Brands Jerky will focus on a 3 ounce/84 gram bag of their Beyond Original flavored beef jerky. The bag was kindly submitted for review by COO Lance Wood. The liquid marinade used here consists of just an average brand of soy sauce, and a well-respected brand of Worcestershire sauce. 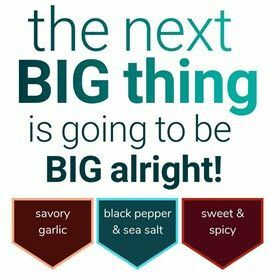 Some healthy ingredients are added such as garlic powder, onion powder, paprika, and spices. One of the meat tenderizers used is papain, which is a natural enzyme from the fruit papaya, and used as a meat tenderizer in the food industry. The sugar level is great at only 0 grams of sugar rounded down per 28 grams of jerky. The salt level is extremely high at 820mg of salt per 28 grams of jerky to lose two ratings. Our preference is 350mg of salt or less per 28 grams of jerky. This jerky does qualify to have no sodium nitrite, or any other unhealthy preservatives. Instead, salt is the main preservative used. Questionable monosodium glutamate (MSG) is used outright to lose a rating. The Patriot Brands Beyond Original Beef Jerky is not your typical Original jerky. At first, it pretty much smells and tastes like a relic from St-Elmo’s. The smokiness, soy, salt and the anchovies to a lesser degree do stand at the forefront and they are quite strong for that matter. There is a nice little bite of spiciness and acidity on the finish. These spicy and acidic notes are really enjoyable and they deepen this flavor profile. The texture is not bad in general although there is some occasional silver skin. The meat can also feel fibrous or somewhat like a dry dish rag at times. Overall, I do enjoy this heavier smokiness and saltiness. Although I find some very interesting flavors, the natural flavor of beef is fairly muted but not entirely drowned in the marinade. I recognize that some people may be turned off or feel overwhelmed by such strong and bold flavors but to others this will probably be like a little slice of Heaven. 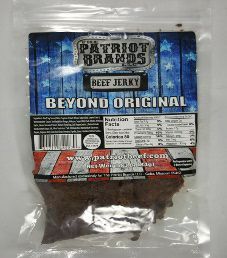 The Patriot Brands Jerky Beyond Original Beef Jerky is a tasty meat snack and I do find it addictive, I certainly can understand however why some may not share my views. I would probably recommend this jerky to more adventurous folks, heavy smokers or someone infatuated with the Roman Emperor Nero. I rate this jerky an 9/10 taste rating. A 3 ounce/85 gram bags sells online for $8.75. That works out to $2.91 an ounce, which rates as a borderline expensive price. The majority of bag categories are covered here. Missing is a blurb printed about The Patriot Brands Jerky and this beyond original flavor, Also missing is soy/wheat allergen warnings, and a best before date, but a sticker on the back is likely the batch number, which could translate to a best before date.